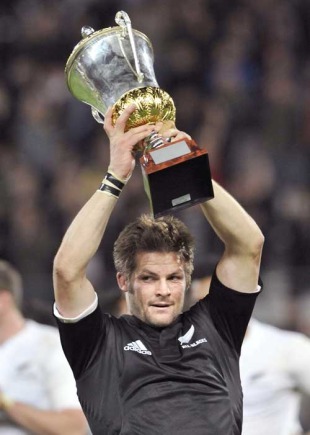 The champions of the last decade may have been proclaimed earlier this week, with Daniel Gilhooly's calculation of an All Black winning percentage of over 82 per cent across 122 matches - plus his acknowledgment of the two extremely large asterisks that needed to be affixed to that title - but there are plenty more awards to be extracted from 10 years of international rugby. Second place, in a photo-finish with five teams (seven if you include Argentina and Georgia) separated by just over five per cent, goes to Ireland (65.76%), testimony to their Six Nations consistency, but an outcome that must still leave them wondering how they only claimed a single title and Grand Slam compared to two for Wales (48.29%). England, who account historically for many more draws than any other team, went through the entire decade without ending a single match all square. Nobody won more caps than George Smith, who played 110 times for Australia and is still a little way short of his 30th birthday. Next in line is John Hayes, with 99 for Ireland and the Lions. The man who started most matches, though, is Brian O'Driscoll, none of whose 95 appearances has been as a replacement. Most used sub was Phil Waugh, 35 times. And given that so many of the images of Joe Worsley's international career have been of frustration - concluding with that agonised gesture as he was led off in the opening minutes against New Zealand - it is a pleasure to report that he can claim one prize, as the most-capped Englishman (73) of the decade in which they won the World Cup. Richie McCaw (70) has played in most winning teams, but the man with the truly unblemished record is Georgian wing Irakli Chkhikvadze, all of whose 10 appearances have ended in a victory. Being a versatile back and an incredibly reliable goal-kicker has earned Chris Paterson the dubious distinction of playing in more losing teams, 59, than anyone else, but he has at least won some of the time - a pleasure yet to be experienced by the Czech Republic centre Pavel Vokrouhlik in 10 appearances. The title of leading points-scorer was still up for grabs until the final test weekend of the decade, with Dan Carter's 16 points for New Zealand in Marseilles taking him past Jonny Wilkinson (984 points), but leaving him still six short of the 1000 mark. Ronan O'Gara was a strong third, with 929 points. Carter's lead was built on having the chance to land more conversions - 169 - than anybody else. Wilkinson was the most prolific kicker of penalties, with 197, and one of the statistical oddities of the decade was that England, South Africa and New Zealand landed an identical number of penalties, 339. Nobody is more pre-eminent in any category than Wilkinson - doubtless to the accompaniment of ironic Antipodean-accented cheers - in drop goals. His 31 are more than twice any other player - with second place on 14 shared by O'Gara and the Portuguese outside-half Gonzalo Malheiro, who ran up that total in only 37 matches - a rate per match only slightly inferior to that of Wilkinson. Malheiro's tally is in turn twice as many as the total of drop goals scored by the All Blacks during the entire decade - a record which sheds some light on their failure to do the blindingly obvious in the final minutes of their World Cup exit in Cardiff in 2007. Leading try-scorer during the decade was Daisuke Ohata of Japan with 56. Among the established nations, Shane Williams' 50th international score, for Wales against Argentina, squeezed him ahead of Doug Howlett (49), with Joe Rokocoko next in line on 45. Perhaps the most interesting statistics of all, if only because they are so rarely discussed, are those relating to discipline. It was pointed out, when Schalk Burger was yellow-carded for the Springboks against the Lions - and felt by many spectators to be lucky to have received only that - that it made him the all-time sin-bin leader with six yellows in 55 tests. "The team likeliest to be yellow carded is South Africa, with 64 sin binnings across the decade. They have also had fewer opponents binned, 31, than any of the other traditional rugby nations." It cannot, though, be said to make him the outstanding villain of the decade, since both of the men who have received five yellow cards have also been shown a red one. And here Nathan Hines outpoints Marco Bortolami, by virtue of accumulating his infractions more rapidly, 61 matches against 76. Dishonourable mentions here to Canada's Jamie Cudmore, who has been yellow-carded four times in 19 matches, France's Benjamin Boyet (two in five, some going for an outside-half) and the Italian Walter Cristofoletto, who played two matches in the 2000s but was yellow-carded in one and saw red in the other. Unsurprisingly, that ended his 31-cap career for the Azzurri. The team likeliest to be yellow carded is South Africa, with 64 sin binnings across the decade. They have also had fewer opponents binned, 31, than any of the other traditional rugby nations - a net disadvantage equating to more than a quarter of their matches. Bok fans may feel they are misunderstood by referees, while those of other nations have other explanations. They have also had three players sent off, but no opponent has seen red. For those who appreciate the spectacle of 14-man rugby, Italy are the nation to watch. They have had 58 men yellow-carded, while 57 opponents - more than against any other team - have been binned. Eight of the 33 international sendings-off during the decade - four each for and against, both top of the list - have been in matches involving Italy. The other end of the table suggests that, in spite of Boyet's spirited attempts to uphold national stereotype, the frequently-cited concept of French indiscipline is due for a serious rethink. Their 21 cards were fewer than any other major nation (with Ireland next on 23). More than twice as many opponents (45) were sent to the bin. France are also one of five major nations - the others being Ireland, Wales, New Zealand and Australia - not to have had a player sent off this decade. Bernard Laporte and Marc Lievremont may have baffled fans and journalists more consistently than any other team's coaches over the past decade, but there was clearly one thing that they got right.